The story of the Beast-God Kong begins on a remote Indian Ocean island—Skull Island. There Kong is a giant ape the last of his kind and ruler of all he can see. The humans on Skull Island have built a great wall to keep Kong away from their village. There is a gate in the wall used to make offerings of a young woman to the beast-god. When the crew of the good ship Wanderer follow the mad plans of Carl Denham to this unknown paradise, Ann Darrow becomes Kong’s plaything. First Mate Jack Driscoll leads the party to reclaim Ann from her horrible fate. As Kong pursues Ann, Denam makes his move. He has brought gas bombs and mercy bullets filled with knockout drugs. He becomes fixated on bringing Kong back to America as “The Eighth Wonder of the World.” Denham follows only one law—his own. Unable to return through the Suez Canal without a lot of questions, their only choice is to circle the Cape of Good Hope and sail the Atlantic back to New York. But Kong needs a lot of provisions, and he has stirred several times. As the ship nears the coast of African, Kong escapes to the jungle. But this isn’t Skull Island, it is Africa. Here Tarzan is the Lord of the Jungle—and Kong is an intruder! 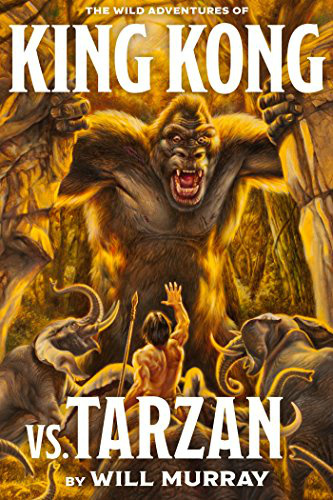 Overall, the book is the adventures of Kong, so Tarzan is relegated to a minor supporting role. Both Carl Denham and Jack Driscoll have more screen time than Tarzan. For once in my reading of Will’s books, I had to put the book down at times. That may be due to the fact that I have a collection of books on Kong, and the story cannot help but follow a familiar path. Adding the invasion of Tarzan’s home was brilliant, but I was hoping for more Tarzan than I got. I give the book three stars. Not bad. Not bad at all.